Bed and Breakfast Creu de Tau Art&Spa-Adults only in Capdepera is a B&B with 1 room. Situated in Capdepera, Hotel Creu de Tau Art&Spa-Adults only features a seasonal outdoor swimming pool, fitness centre and free WiFi. There is a spa and wellness centre comprised of a hot tub and sauna. Guests can enjoy Spanish dishes at the restaurant or have a cocktail at the bar. The units in the hotel are equipped with a flat-screen TV with satellite channels. 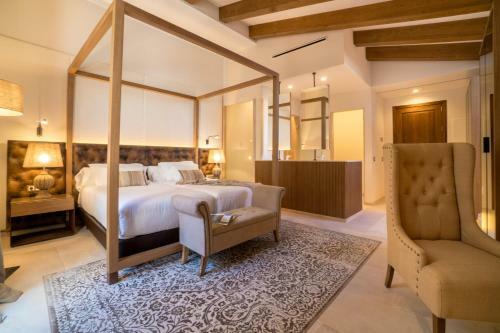 The rooms have a private bathroom and a shower, and some units at Hotel Creu de Tau Art&Spa have a terrace. All rooms have a desk. A ...continental breakfast is available every morning at the accommodation. At Hotel Creu de Tau Art&Spa-Adults only guests are welcome to take advantage of an indoor swimming pool. Languages spoken at the 24-hour front desk include Catalan and German. Alcudia is 41 km from the hotel, while Cala Millor is 14 km from the property. The nearest airport is Palma de Mallorca Airport, 74 km from Hotel Creu de Tau Art&Spa. Situated in Capdepera, Hotel Creu de Tau Art&Spa-Adults only features a seasonal outdoor swimming pool, fitness centre and free WiFi. There is a spa a...nd wellness centre comprised of a hot tub and sauna. Guests can enjoy Spanish dishes at the restaurant or have a cocktail at the bar. The units in the hotel are equipped with a flat-screen TV with satellite channels. 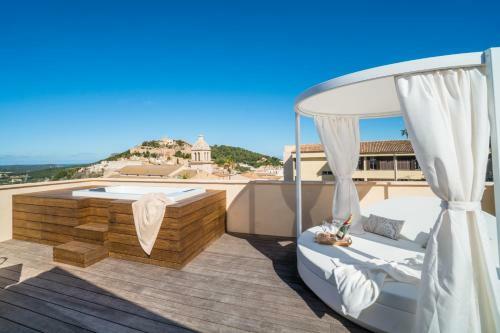 The rooms have a private bathroom and a shower, and some units at Hotel Creu de Tau Art&Spa have a terrace. All rooms have a desk. A continental breakfast is available every morning at the accommodation. At Hotel Creu de Tau Art&Spa-Adults only guests are welcome to take advantage of an indoor swimming pool. Languages spoken at the 24-hour front desk include Catalan and German. Alcudia is 41 km from the hotel, while Cala Millor is 14 km from the property. The nearest airport is Palma de Mallorca Airport, 74 km from Hotel Creu de Tau Art&Spa. When would you like to stay at Hotel Creu de Tau Art&Spa-Adults only?